Since January 2014 the Czech Republic is ruled by a centre left-coalition, holding 111 of the 200 seats in parliament. The coalition is led by the leftist Czech Social Democratic Party (CSSD), while the other two parties in the coalition are the centrist ANO 2011 and the Christian Democrats (KDU-CSL). 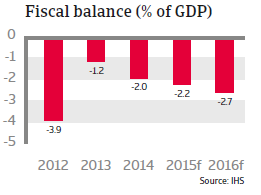 The Czech economy suffered a contraction in 2012 and 2013, partly as the result of austerity measures, as tax increases and public sector cuts lessened the purchasing power and confidence of both households and businesses. At the same time, lower demand from EU trading partners hit exports. At more than 75%, the Czech Republic’s export-to-GDP ratio is one of the highest in the EU, making it especially vulnerable to foreign trade losses. 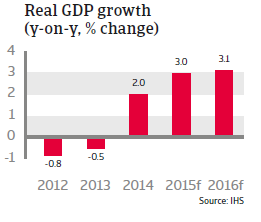 That said, growth returned in 2014, thanks to higher private consumption, rising investment and government spending. 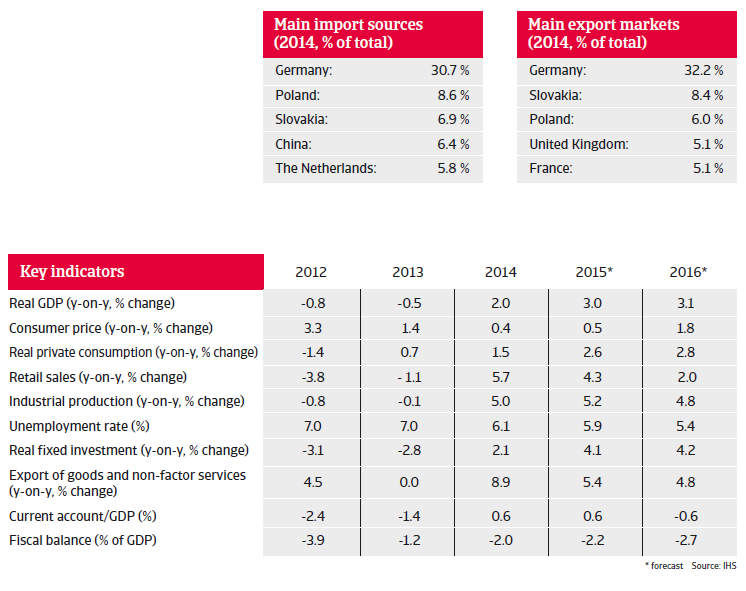 Due to robust domestic demand and benign economic conditions in the Eurozone, Czech GDP is expected to grow 3.0% in 2015 and 3.1% in 2016. Private consumption, industrial production and investment growth are expected to accelerate further in 2015, while exports continue to increase, as the country´s international competitiveness has improved. In order to improve the country´s competitiveness and boost exports, in November 2013 the Central Bank intervened in the currency market by buying euros in order to weaken the koruna against the euro. Since then, it has repeatedly stated it will automatically intervene in order to keep the koruna rate close to a currency ceiling level of 27 per euro, at least until mid-2016. As the economy has gained strength again and the koruna showed an appreciating trend, in July 2015 the Central Bank intervened again in the foreign exchange market to keep the currency ceiling. A second objective of the Central Bank´s interventions is to spur inflation, as the koruna depreciation makes imports more expensive. 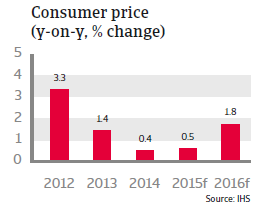 Since the end of 2012 – and as the effects of a VAT increase have faded – consumer prices have begun to drop, and despite a recent increasing trend, inflation is expected to reach only 0.5% in 2015; still below the Central Bank´s target of 2%. Finally inflation is expected to increase to 1.8% in 2016. The Czech Republic´s unemployment rate reached 6.1% in 2014 (down from 7.0% in 2013) and is expected to decrease further in 2015 and 2016 with the economy gaining strength. Government finances have improved in 2013 as the budget deficit decreased from 3.9% of GDP in 2012 to just 1.2%, putting it below the 3% of GDP Maastricht threshold. Since then, the budget deficit has remained below this threshold and is expected to do so in 2015 (2.2% of GDP) and 2016 (2.7% of GDP). Government debt decreased in 2014, to 42.6% of GDP from 45.0% of GDP in 2013. 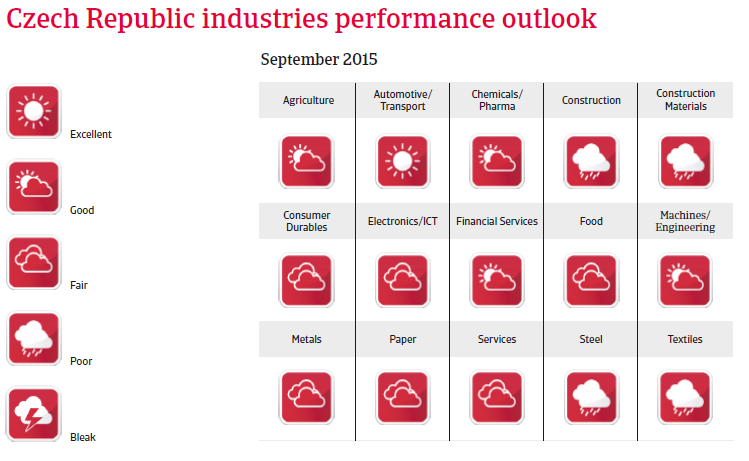 It is expected to decrease further in 2015, to 41% of GDP, which is low compared to other countries in the region. Government debt is forecast to remain on a low level in the coming years due to robust economic growth. The improvement in public finances means that the Czech Republic would have no troubles adhering to the adoption criteria of the euro. However, entering the eurozone still remains a controversial issue in Czech politics, and it is not expected that the country will enter the eurozone before 2018. The current account is stable, and expected to reach another surplus of 0.6% of GDP in 2015, followed by a 0.6% of GDP deficit in 2016, as a buoyant domestic market will raise the level of imports. The level of foreign debt has increased significantly in recent years, to more than 55% of GDP (from 42% of GDP in 2007), but remains manageable.